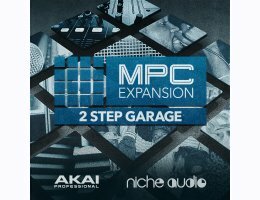 Akai Professional, Niche Audio present 2 Step Garage capturing the pulsating drums and slick chord progressions from the UK Garage scene. 2 Step Garage serves up a bumpin’ selection of 13 diverse MPC kits allowing producers worldwide to start creating inspirational Garage jams immediately. Taking influence from legendary producers such as MJ Cole, El-B and Artful Dodger, this package contains over 200 authentic samples in pristine 24bit and seamlessly brings together the full spectrum of sounds, effortlessly running the line between classic UKG vibes and modern trends. Niche Audio have enrolled Scott Diaz, another top-notch producer who has created a 100% authentic 2 Step Garage pack for MPC. Inside you will find thirteen MPC ready kits, consisting of an assortment of Deep Club Kicks, Crackin Snares and Claps, Vocal cuts and FX for instant creativity. Also included are Midi Patterns and MPC Sequences along with One-Shots for customising your own kits.